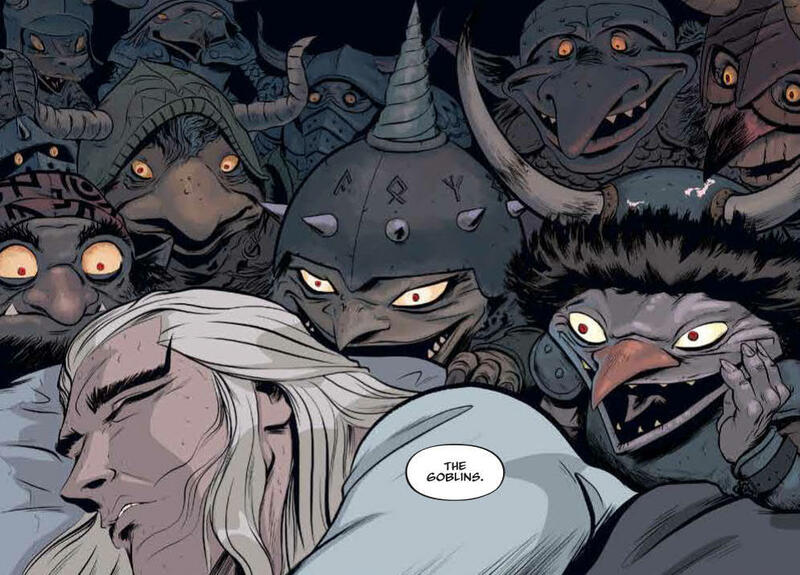 Jim Henson's Labyrinth: Coronation #2 Review – AiPT! Issue #2 continues the fable that Jareth is telling Toby while waiting for Sarah to complete the labyrinth. Jim Henson’s Labyrinth: Coronation continues with Maria being returned to the real world after her child is taken from her by the goblins. She confronts her husband, Albert, and asks him what he has done. Albert insists that she is insane and that his bodyguard Lorenzo witnessed her fall into the water at the docks with the child so he must have drowned. Maria does not accept this and after she refuses to relent Albert finally gives in. He tells Maria about how the goblins wanted him to be their King so Albert asked them to take his child instead. Maria begs Albert to take back the offer but it is no use, the deal is done. Upset and desperate to find her son, Maria takes to the streets to expose Albert for what he has done only to be shunned as a lunatic by the townsfolk. In one last desperate effort she begs the goblins to give her back her son. The ancient Owl King hears her pleas and transports her back into the labyrinth. He tells her that she has 13 hours to solve the labyrinth or the child will remain there as his successor. Maria wastes no time and sets off into the labyrinth to save her child. As she makes her way through, Maria runs into a mermaid trapped in a net who offers to help her find the castle in exchange for her release. As is everything in the labyrinth, all is not as it seems and Maria finds herself in a trap. The mermaid was just a disguise meant to lure Maria closer. The creature grabs Maria’s arm and pulls her down into the water to some catacombs where she intends to feed Maria to her children. At the last moment Maria is rescued by a knight and whisked off to safety. The knight introduces himself as Siir Skubbin, Knight of the Order of the Garderobe. Just when it seems that Maria’s luck has turned around, the knight grabs the chalk that belonged to her son out of Maria’s hand and runs away with it, leaving Maria discouraged and her will broken. This amuses the Owl King as he wonders what other hardships she will endure along the way to save her child. The issue ends with Jareth stopping his story for another time so he can put on a disguise to deceive and torment Sarah. The writing on this series continues to be nothing short of amazing. 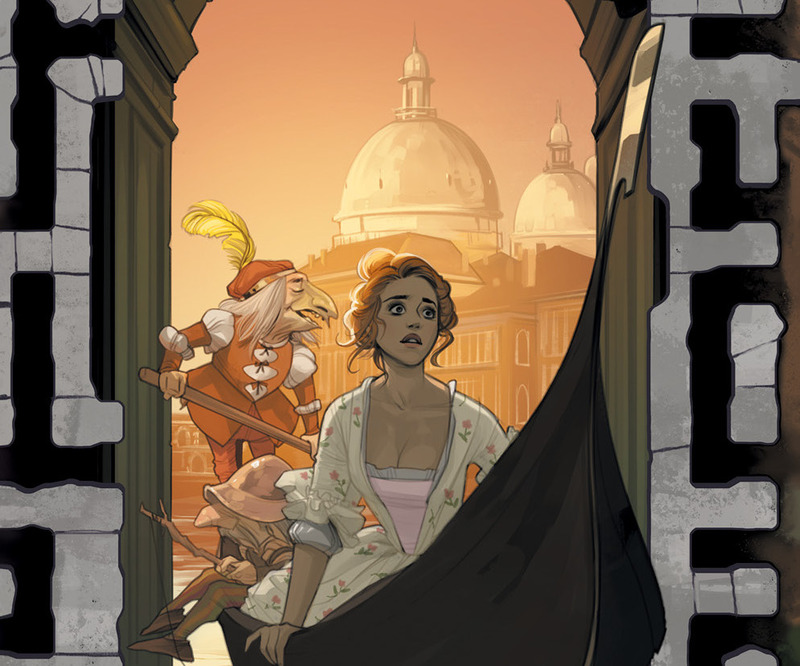 Simon Spurrier does such a wonderful job of drawing parallels between Maria’s journey and Sarah’s journey to tie the two stories together seamlessly. This story-within-a-story not only takes you deeper into the Labyrinth but also carries over to events from the original film. Spurrier gives us new and exciting characters like the Owl King and Sir Subbin to ponder. There is also a bit of mystery written into the story involving Beetleglum. There’s more to this character than meets the eye and Spurrier is clever in the way that he writes the interactions between Beetlegum and Jareth. 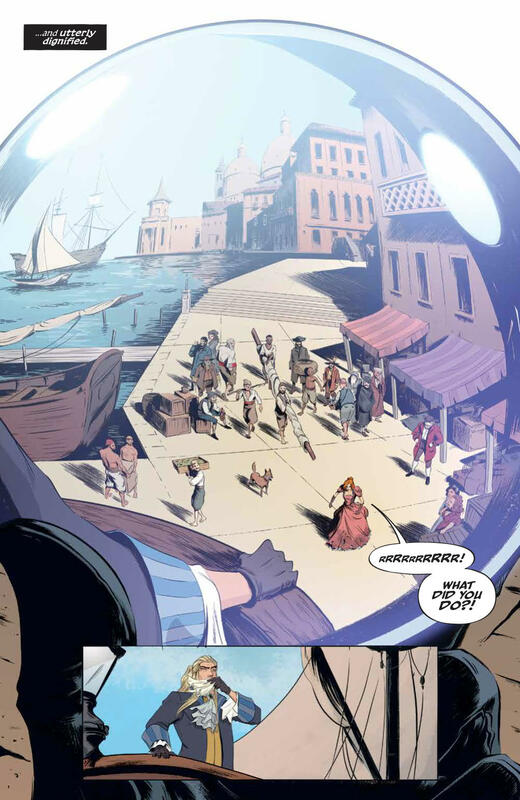 Simon Spurrier really knows how to create stories within the context of the Jim Henson universe. He did it beautifully in Power of the Dark Crystal, and this new Labyrinth series is no exception. The images and environments that Daniel Bayless puts to the page for this issue are even more beautiful and fantastic then the last. The Owl King is drawn very majestically yet terrifying and Bayless’s use of perspective and composition on certain frames is breathtaking. One panel in particular of Jareth viewing the Owl King viewing Maria all through the use of the orbs is a work of artistic genius. Dan Jackson rounds everything out perfectly with his coloring yet again. His use of shading and highlights add such an emotional value to the already beautiful artwork. The way he sets the mood and the tone of every scene in this issue is wonderful. This series is shaping up to be an amazing collection for any Labyrinth fan or lover of fantasy stories. It is compelling and fresh yet stays true to the source material and this second issue is even more exciting and mysterious than the first. It leaves the reader captivated, emotional, and wanting more at the end of it. Jim Henson's Labyrinth: Coronation #2 is awesome! It takes us even deeper into the lore and the world of the labyrinth while also giving us a glimpse into what was going on behind the scenes with the characters from the original film. Beautiful artwork and images that flow through every page sucking the reader into that universe and staying with them long after. Even more insight to the character of Jareth and his backstory. We have to wait an entire month for more.